St Martin of Tours is not well known in the Orthodox Church, but as a saint of the undivided church he deserves to be remembered. His feast day of 11 November (Russian tradition, 10 November in the Greek tradition) is also observed as Remembrance Day, for remembering those killed in wars, since it was Armistice Day in the First World War. 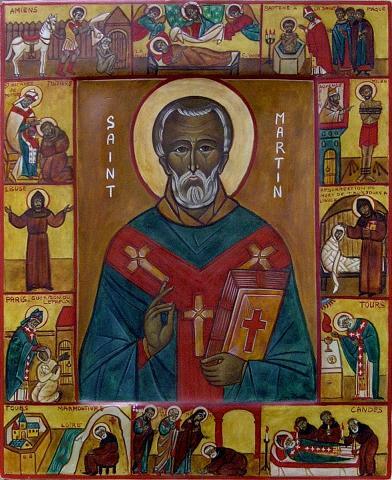 Martin was a soldier, but when he became a Christian he became a conscientious objector, and resigned his commission. His commanding officer accused him of cowardice, and so he offered to stand, unarmed, between the opposing sides on the battlefield. The Western Confucian has blogged this, with a suitable picture. He had toyed with becoming a Christian for quite a long time, but had never been baptised. One winter day when he was riding his horse he saw a poor beggar shivering in the cold, and cut his cloak in half and gave half to the beggar. If the cloak was part of his military issue, we was destroying government property. But then he had a dream of Jesus saying to him “Only a catechumen has given me this cloak,” and he decided to be baptised. Martin later became Bishop of Tours where he established one of the early instances of the parish system, with churches being established in rural villages, and priests being sent from the town to be responsible for their pastoral care. Previously there had been a single church in most towns with the local bishop presiding at the Divine Liturgy assisted by presbyters and deacons. St Martin established suburban and rural parish churches to make it easier for Christians in outlying areas to gather regularly. In Orthodox Churches the link of parish churches with the bishop is shown by the Antimension, given by the bishop, without which a priest may not serve the Divine Liturgy. You may read the life of St Martin here. In signs and in miracles you were renowned throughout Gaul. By grace and adoption you are a light for the world, O Martin, blessed of God. which you dispense freely to those who honour you. and as a seer of the Trinity, you shed your blessings on the Occident. preserve us, O Saint Martin, and save all who praise your memory. St Martin was the mentor of another of my favourite saint, St Ninian of Whithorn, the first missionary to what is now Scotland.